DETROIT – Dutch adventurer Wim Hof is known as "The Iceman" for good reason. Hof established several world records for prolonged resistance to cold exposure, an ability he attributes to a self-developed set of techniques of breathing and meditation — known as the Wim Hof Method — that have been covered by the BBC, CNN, National Geographic and other global media outlets. Yet, how his brain responds during cold exposure and what brain mechanisms may endow him with this resistance have not been studied — until now. Wayne State University School of Medicine professors Otto Muzik, Ph.D., and Vaibhav Diwadkar, Ph.D., changed that. Their publication, "Brain Over Body: A study on the willful regulation of autonomic function during cold exposure," published in the journal NeuroImage, is the first to study how The Iceman's brain responds during experimentally controlled whole-body cold exposure. These investigations are part of the scientists' series of seminal studies launched in 2014 on how the human brain responds to thermoregulatory challenges. The results document compelling brain processes in The Iceman and present intriguing possibilities for how his techniques might exert positive effects related to disorders of the immune system and even psychiatry. Over three days, Muzik and Diwadkar studied Hof's brain and body functions using two distinct imaging techniques — including functional magnetic resonance imaging (fMRI) to study his brain and positron emission tomography (PET) to study his body. During the studies, Hof wore a specifically designed whole-body suit the researchers could infuse with temperature-controlled water while the imaging data were acquired in order to relate changes in his biology to cold exposure. The Iceman's results when compared to a group of healthy comparison participants were startling. 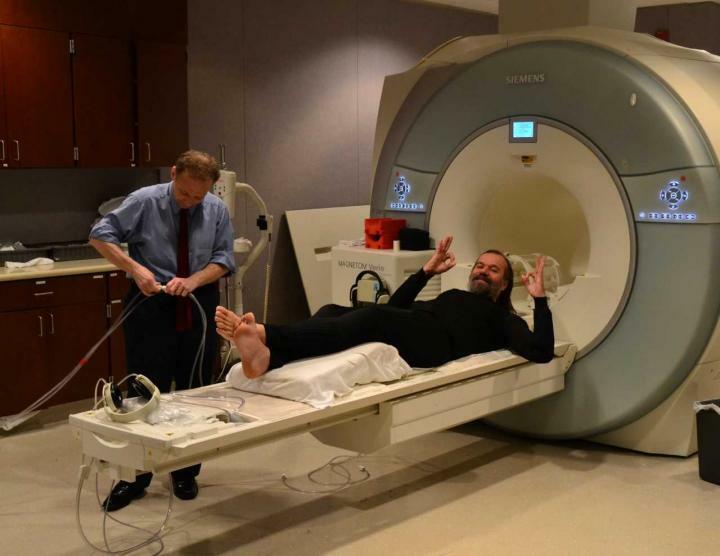 Practice of the Wim Hof Method made Hof's skin temperature relatively invariant to cold exposure, a finding the researchers attributed to his increased sympathetic innervation and glucose consumption in intercostal muscle revealed by PET imaging. The method appeared to allow him to generate heat that dissipates to lung tissue and warms circulating blood in the pulmonary capillaries. "The willful regulation of skin temperature — and, by implication, core body temperature, even when the body is being stressed with cold — is an unusual occurrence and may explain his resistance to frostbite," said Muzik, professor of pediatrics, of neurology and of radiology. "From our previous studies, we expected The Iceman to show significant brain activations in a region known as the anterior insula, where the brain's higher thermoregulatory centers are located. However, we observed more substantial differences in an area called periaqueductal gray matter, located in the upper brainstem. This area is associated with brain mechanisms for the control of sensory pain and is thought to implement this control through the release of opioids and cannabinoids," Muzik added. These last set of results are striking — not only for what they reveal about The Iceman, but even more so for the implications of the relevance of the Wim Hof Method for behavioral and physical health. The researchers hypothesize that by generating a stress-induced analgesic response in periaqueductal gray matter, the Wim Hof Method may promote the spontaneous release of opioids and cannabinoids in the brain. This effect has the potential to create a feeling of well-being, mood control and reduced anxiety. "The practice of the Wim Hof Method may lead to tonic changes in autonomous brain mechanisms, a speculation that has implications for managing medical conditions ranging from diseases of the immune system to more intriguingly psychiatric conditions such as mood and anxiety disorders," said Diwadkar, professor of psychiatry and behavioral neurosciences. "We are in the process of implementing interventional studies that will evaluate these questions using behavioral and biological assessments. These possibilities are too intriguing to ignore." "It is not mysterious to imagine that what we practice can change our physiology. The goal of our research is to ascertain the mechanisms underlying these changes using objective and scientific analyses, and to evaluate their relevance for medicine," Muzik added.